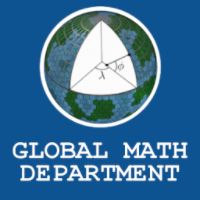 Reminder, it’s summer vacation for webinars at Global Math. We’ll be back in August. Is this how it’s going to be from now on each summer? Guns, police, death and protests? What could this look like? Rethinking Schools has a book. Radical Math has a “Guide for Integrating Issues of Social and Economic Justice into Mathematics Curriculum.” It includes advice, sample problems, and a lengthy table with links to online data resources sorted by mathematical area. For example, under “fractions” they list a link to the site “Cost of War”. They also suggest lessons on AIDS, the lottery, gentrification and factors impacting high school graduation rates. Scrolling through the guide, I wondered what a version of the guide would look like under other political influences. A statistics lesson on political affiliation and bias in? Using percents to show the failure of the welfare state? If equitable math instruction involves incorporating your politics, does having wrong politics make you a worse math teacher? I worry about this, but that doesn’t mean this project isn’t important and worth pursuing. Beyond a socially relevant curriculum, there is also the question of policy. Danny Martin questions whether NCTM is truly committed to equity in mathematics. After all, NCTM’s focus (in Principles to Action and other documents) is on excellent teaching, curriculum and resources equitably distributed. This, Martin argues, is a policy that is fundamentally incapable of closing achievement gaps, even if it would lead to absolute gains for all. 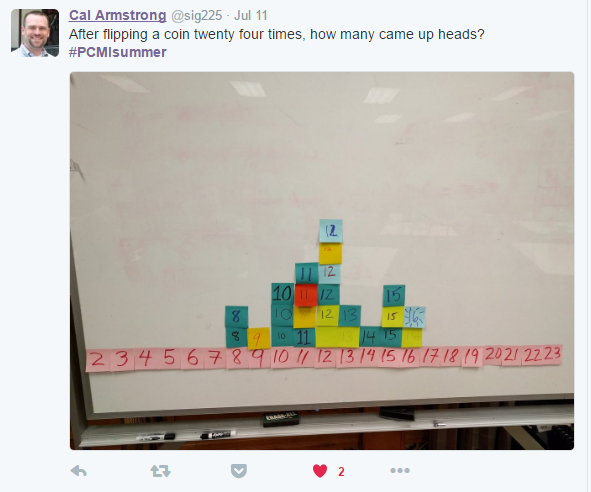 Michael Pershan recently posted about using a math mistake from a 4th grader in a Desmos Activity. 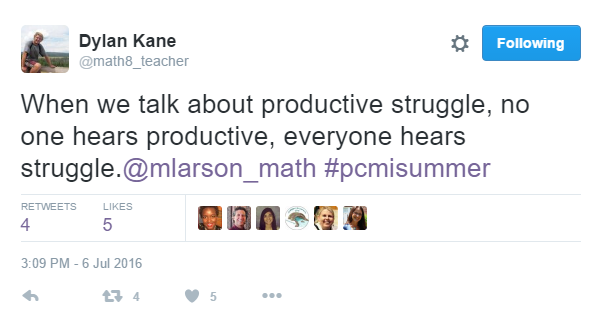 Imagine how potentially powerful this could be for you, your students, and colleagues. I simply would like to share a half-dozen reasons WHY I like Michael’s Desmos Activity. Imagine teachers quickly putting an activity together with a student mistake from their class and then sharing it with their students and colleagues to analyze. Great inspiration, Michael. Read more here. 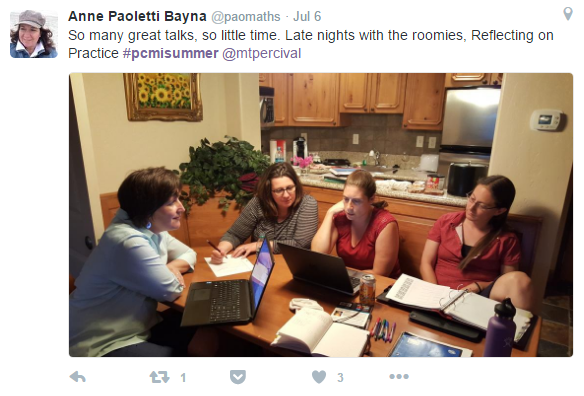 PCMI (Park City Math Institute) 2016 is in full swing. 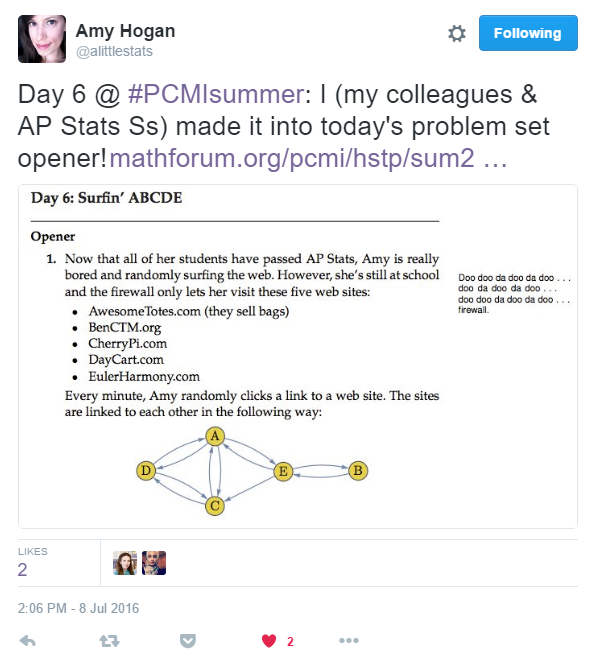 Play along with PCMI Problem Sets (click here)! 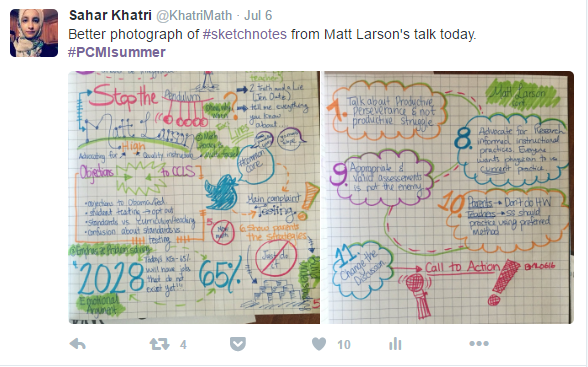 Global Math’s Out for Summer!